Nails and Personality: Part One. Our personality, even the most intimate secrets that we have, is written in all the external features that make us unique. For the experts, it is simple to interpret: physiognomy, chirology and other disciplines have developed similar disciplines have developed interesting studies on this issue. Such is it that, inside chirology, which is in charge to analyze different lines and particularities of the hand regarding the personality, it can be distinguished a more specific area: “oniology”. It is a deviation of the chirology, especially dedicated to the study of the color, form and the size of the nails and their connection to the hidden characteristics of the way of being of people. Experts in oniology point to the fact that, from the study of the nails, it is posible to detect the qualities and the defects of people, as well as to diagnose the illnesses and tyhe pains that they suffer which are hard to detect from the conventional analysis in labs. Because of this, if you want to know more about yourself and from people surrounding you, make a detailed observation of the your nails of the nails from the people you want to know better, taking into account the lines that we point here. 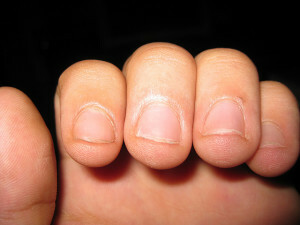 Here, we expose some of the most common forms of then nails and the kind of personality that each of them represents. Flat, square and large: the lifestyle of those who have this kind of nails is, to some extent, contradictory because, on the one hand, these people are lazy and inactive and, on the other hand, they are people who are very effective in the tasks they perform. Large: individuals with large nails, that’s to say, longer than wider, are people who own an energy to all proof and who prefer to be closed within themselves rather than explaining their problems to the rest of people. Short: if the nails of a person are short, this is wider tan longer, it means that it is a person who is very intelligent, astute, awake and, in some occasions, a little foolish. Almond form: the fantasy and the dream world is at the forefront of those who have almond shaped nails. The respect they feel for others and the diplomatic spirit are their fundamental qualities. Very wide: if a person’s fingernails are excessively wide, this means that this person cannot avoid making judgments and scathing criticisms regarding the attitudes of others, which often can cause significant damage to the personality of these people. Curve nails: the nails that when they begin to grow, they start getting curve are indicative of a very special character. Their owners are generally mild and moderate individuals, who will often feel deeply hurt if someone offends them even when there is not a bad intention to do so. These people are extremely sensitive and they can fall in real wells of real depression. Small: the nails that are smaller than the common size show that the person is predisposed to suffer any kind of illness. Curve and short: if the nails of someone respond to this combination, it means that there us a predisposition to suffer illness regarding the lungs and the throat.